While I was speaking at the annual Hiroshima Day commemoration in Merrion Square, Dublin, this afternoon [6 August 2016], a Facebook friend was visiting a bunker in Portadown. She went to say that the tour guide shows my book to all who visit the bunker. It was open day today at the bunker, which is 15 ft below a field on the outskirts of Portadown. The former monitoring bunker is a relic of the Cold War, and was once part of a wider network of similar structures throughout the United Kingdom, built to study and report the effects of nuclear explosions and the resulting radioactive fallout. They were operated by men and women of the Royal Observer Corps, who were expected to spend three weeks below ground during a nuclear exchange. The bunker was closed in 1991 but it has now been fully restored to as it would have been in the 1980s at the height of the Cold War. The guide who recommends my book is Alistair McCann, and the other guide in the bunker in Portadown this afternoon was Colin Woods. I am flattered and amazed that Alistair McCann is recommending this book 32 years after it was first published in 1984, which is half a lifetime away. At the time, I was chairing both the Irish Campaign for Nuclear Disarmament and Christian CND, and writing a post-graduate theology thesis comparing different attitudes in the Roman Catholic Church on nuclear weapons and nuclear disarmament. 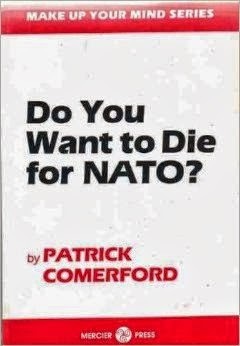 As a consequence of a late night meeting in Sean MacBride’s home, Roebuck House, with Todd Andrews and Captain John Feehan, I was also commissioned to write my first book, which was published by Mercier Press in 1984 with a title that now seems very twee to me, Do You Want to Die for NATO? Some years ago, the Belfast Telegraph published a “chilling map” that shows how Northern Ireland was marked for a nuclear Armageddon during the Cold War. The report said the targets were pinpointed in Northern Ireland in 1980 in case the Kremlin decided to conquer the UK, and cited as its source my book Do You Want to Die for NATO? It went to say Comerford said: “The strategic position of Ireland, the facilities offered by ports and airports, and the fuel stocks make it highly likely that Ireland will be a target.” He said the Republic was just as much at risk as Northern Ireland. The book was written 32 years ago when I was 32. It is sad to realise that it is still relevant today. I was saying this afternoon that world tensions are as heightened today as they were at the height of the Cold War. Perhaps the guides in the bunker need an up-to-date version of my book from the 1980s. If Mercier Press ask me to update it, I might consider renaming it: Do You Want to Die for Trump? I was in Hiroshima at the height of the Cold War, and returned to Japan as the decisions were being taken to deploy Cruise and Pershing missiles in Europe. We responded then, and we were effective. The missiles were removed, and the women at Greenham Common ensured the missile silos were removed and the land was returned to common land, to open green countryside. But not since those days have I been so frightened and so fearful about the future, not only of the future for Europe, but the future for the world, the future for future generations. This week it has been reported that Donald Trump asked a foreign policy expert advising him why the US cannot use nuclear weapons. Joe Scarborough of MSNBC reported Trump’s remarks on Wednesday [3 August 2016], quoting a source inside the Trump campaign in the Republican Party. Joe Scarborough hosts the Morning Joe programme. He reported Trump’s comments 52 seconds into an interview with General Michael Hayden, a former director of the CIA and a former director of the National Security Agency. Joe Scarborough then asked General Hayden a hypothetical question. He asked about how quickly nuclear weapons could be deployed if a president were to give approval. There you have it. The system is designed for speed and decisiveness. It is not designed for any debate about the decision. There can be no debating. There is no time for that. If a President Trump decided to use nuclear weapons, there can be no questioning. No questioning his wisdom. No questioning his morality. No questioning his sanity. The generals, and everyone they call on, have to follow orders. That was the defence offered at Nuremberg. And that is a defence that for over 70 years has not been acceptable in international law. But this is what we can expect if Trump is elected. General Hayden is no marginal figure. He was the director of the CIA from 2006 to 2009, when George W Bush was President. He was the director of the National Security Agency from 1999 to 2005, when both George W. Bush and Bill Clinton were President. Trump’s question – “If we have them, why can’t we use them?” – has, like so many of his comments, sent out shock waves. But nuclear experts say it is shocking not just for the statements themselves, but for the uncomfortable truths they expose, perhaps unwittingly, about nuclear weapons. Back as long ago as 1957, President Dwight D. Eisenhower, eventually decided nuclear weapons were too destructive to consider. “You just can’t have this kind of war,” he said. “There aren’t enough bulldozers to scrape the bodies off the streets.” Yet Eisenhower considered using nuclear weapons in Korea, and Nixon thought so too in Vietnam. The United States and other nuclear powers have maintained and expanded their arsenals, enhancing their ability to launch nuclear strikes even as they have concluded that the logic of such a conflict makes using the weapons unthinkable. The idea became known as mutually assured destruction, with the appropriate acronym MAD, because the countries with nuclear weapons were afraid, and hoped everyone else was too afraid too to use them. There is a logic that is both flawed and incomprehensible in all this: we are asked to assume that the more willing world leaders are to use nuclear weapons, the less likely they are to do so. Why are we so shocked about the revelations about the mad and bad Trump this week? In an interview back in March, he said he would not rule out using nuclear weapons in Europe. 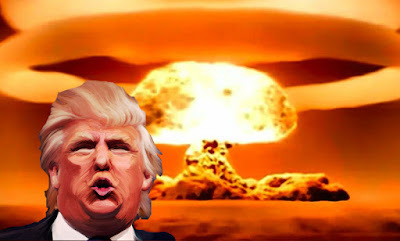 And he has encouraged other countries like Japan, South Korea and Saudi Arabia to develop their own nuclear stockpiles. What an insult to Japan, the only country to have been the victim of nuclear weapons in war. What an appalling vista for South Korea. If you wrote in Trump for these lines in the movie The Interview, viewers would be disgusted by the bad taste. As for Saudi Arabia, who does Trump think is bankrolling and supplying ISIS and inspiring its ideologues? “The whole point of a deterrent is that our enemies need to know that we would be prepared to use it,” she said. “You never get quite used to how terrible such a situation would be,” he said. If Trump can fly off with the Muslim parents of a war victim, if Trump can set his bullies on hecklers in a crowd, if Trump can ask for a crying baby and the baby’s mother to be removed from an audience, how can we trust Trump to keep cool and calm under pressure? I fear for the world with a Trump presidency. I fear that the world may come to an end, not with a whimper, but with a cataclysmic bang. Yes, I fear a Trump presidency. But we do not have to be cowered, we do not have to live in constant fear. There are alternatives. And there are things that the Irish Government can do. The final session of the Open-Ended Working Group (OEWG) began in Geneva yesterday [5 August 2016]. The meetings, which continue for the next few weeks, are hopefully going to make recommendations to the United Nations General Assembly. The Irish Campaign for Nuclear Disarmament (Irish CND), and similar campaigns around the world, are encouraging governments to make sure that the ban treaty features prominently in both the summary of the OEWG and in the recommendations. The first draft of the report notes that the majority of states have called for the start of negotiations of a treaty banning nuclear weapons. This is the appropriate response to the now widespread recognition of their humanitarian consequences. The report notes that a treaty banning nuclear weapons is “the most viable option for immediate action” and that it would greatly advance the stigmatisation of nuclear weapons. Ireland must push for this to be confirmed as a recommendation of the report and should oppose any efforts to weaken or further qualify these points. But there is a group of states that do not support a ban treaty. This group includes nuclear-allied states, and they are going to try to influence the report to give the ban treaty a lower priority than other recommendations. It is vitally important that Ireland is represented at the final session and supports the start of negotiations for the prohibition of nuclear weapons. It is critical that Ireland is present, particularly on the last day [19 August] when there may be a vote on the report. The Irish Government must also emphasise again its clear support for the UN General Assembly convening a conference in 2017, open to all States, international organisations and civil society, to negotiate a legally-binding instrument to prohibit nuclear weapons, leading to their total elimination. This support must be expressed in an Irish statement at the final session. The report provides clear and concrete measures for all states to carry on the work towards achieving a world that is free of nuclear weapons. 1, Make sure everyone you know in America, everyone you know who has a vote in the Presidential election on 8 November, that there must be an alternative to the evil Trump would bring to a fraught and fragile world. 2, Sign up for the Irish Campaign for Nuclear Disarmament (Irish CND). Our need for your help, your time, your skills, your support as a volunteer, has never been so great, not since the Cold War was at its height in the 1980s. 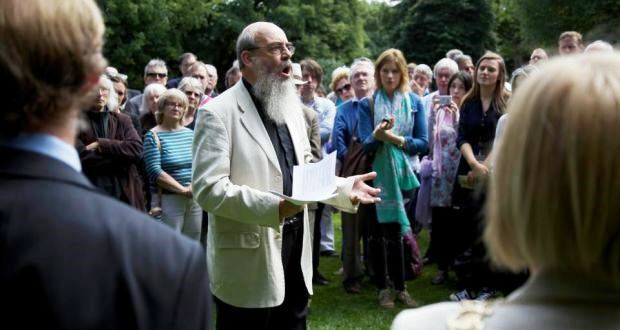 I have been invited as President of the Irish Campaign for Nuclear Disarmament (Irish CND) to speak at this afternoon’s Hiroshima Day commemorations in Dublin. Today marks the 71st anniversary of the atomic bombing of Hiroshima on 6 August 1945. The annual commemoration for the victims of the Hiroshima atomic bomb takes place this afternoon [Saturday, 6th August 2016] at 2 p.m. at the memorial cherry tree in Merrion Square Park, Dublin 2. About 16,500 nuclear weapons remain in the world today. While this is less than the Cold War peak, it is still enough to destroy life on earth as we know it many times over. The ceremony will take place at the memorial cherry tree planted by Irish CND on Hiroshima Day 6 August 1980. The commemoration will be opened by Councillor Mary Freehill, representing the Lord Mayor of Dublin, and Mrs Mari Miyoshi, the Japanese Ambassador to Ireland, will also speak. Representatives of several other embassies have indicated that they will also attend. There will be short contributions of poetry and music from Irish and Japanese artists (weather permitting) and a wreath will be laid at the memorial tree. This annual ceremony is an opportunity to stand in solidarity with the victims of these horrific weapons of mass destruction, and to affirm our determination to work for their elimination, the only way to ensure that the ghastly events of Hiroshima and Nagasaki will not be repeated. Please come along and take part in this moving and inspiring ceremony.